The INRAD 629 microphone is a wide frequency range, unidirectional cardioid dynamic microphone ideally suited for rag chewing and ESSB. It features a large 1.125" diaphragm and an internal rubber element suspension system for reducing undesirable noise. Excellent 180 degree rear rejection cardioid response. Excellent articulation across the specified frequency response with a rise in response to match the voice characteristics of speech. Output tailored to rise from 500 Hz, crossing 1 kHz up to 4 kHz, exaggerating the microphone output frequency response of these vocal frequencies. The result is clear, an overall well-articulated audio response tailored to match intelligibility of human voice. INRAD DMS-629 Represents a revolution in price versus performance for Amateur Radio microphones. Highly unidirectional cardioid dynamic microphone features a large 1.125" diaphragm for clear, full audio response. This mic features excellent articulation with a rise in response to match the characteristics of speech for superior voice intelligibility. INRAD's top of the line microphone. Plug the detachable coiled cable into the mic jack on your transceiver, and you're ready to operate. To use the microphones with any of the 3 conductor TRS + RCA phono, 8 pin Foster, or RJ-45 modular, plug in a different accessory cable. Easy! One detachable cable is included with the $158 purchase price. The base is metal and weighs 2.5 pounds to keep it from sliding around or being knocked over easily on the desk. Total weight of base and desk microphone, over 4 pounds. 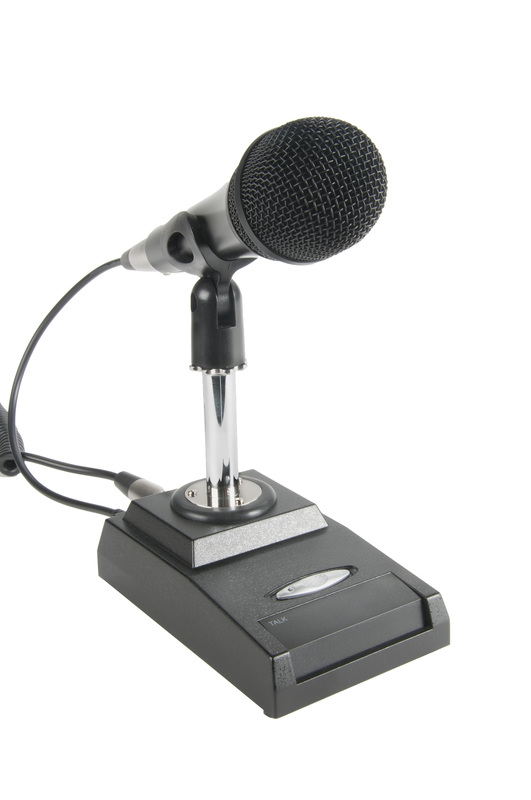 Metal microphone body, standard 5/8 x 27 thread metal standpipe, rubberized microphone clip. The circular rubber ring around the circumference of the metal standpipe for the mic clip is an internal shock mount for noise isolation. Large push-to-talk switch on the base front. To lock the PTT for those longer QSO's, slide the silver slider switch to the left while the PTT switch is down. To release, slide back to the right. Want a different on-air sound from a different INRAD microphone? The M-series microphones on the base are also interchangeable. To change from one mic to another, unplug the 3 pin XLR cable from the back of the mic and pull it off the clip. Plug in the new mic, put it on the stand. It's that simple. Alternatively, the M-series microphones can be purchased alone. M-series microphones are supplied with a cable from 3 pin XLR to 1/8" mono male jack that is used with M-series adapters to plug into the transceiver.